Welcome to October's newsletter. Apologies for being late (again!) this month - but at least I have good news! I've finally finished my first eBook and it's available for instant download! 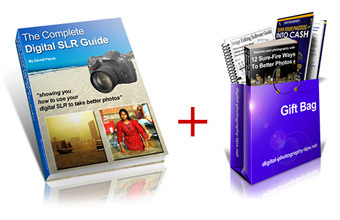 In essence it's a complete photography guide written with digital SLR owners in mind, but useful for all photographers. But it's not just the eBook I can offer to you. I've also added "12 Surefire Ways To Better Photos" - my collection of some of the best submissions to the site. Plus there's a "Software Editing Guide" ready for download too - with details on how to get your hands on free image editing software that's more than a match for Photoshop. And if that wasn't enough I've added Dan Fieldman's triple guide to making money with your camera. This complete package of 6 eBooks has been on sale for a few weeks here at $19. As a subscriber to my newsletter I've arranged a special offer - the complete package for just $9! I'll keep the offer webpage up for four weeks to give you a chance to have a good look. And apologies again for being late out this month. Buy the guide though, and I hope you'll agree that it was worth the wait!